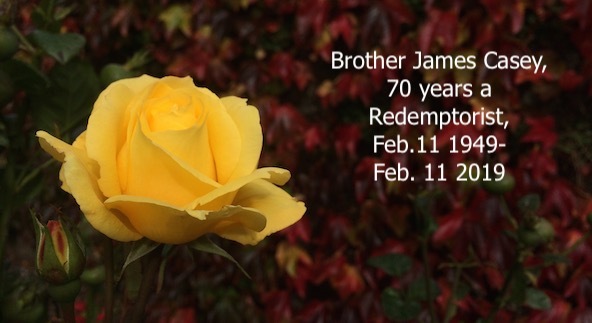 Brother James Casey, Redemptorist, celebrates 70 years as a Redemptorist on Monday, February 11th, 2019. He took his first vows on February 11th, Feast of Our Lady of Lourdes, in 1949. Only for the snow, he would have been a White Father! -or a Brother with the White Fathers. He had written his letter to them, but the great snow of ’47 prevented his posting it. Then he read in the Redemptorist Record magazine that the Redemptorists had Brothers as well as priests. He changed the address, posted the letter, and got a reply back within a week. And so, on May 19thin that year of the great snow, 1947 -two years after the war being finished -he made his way to Cluain Mhuire, Galway, to begin life as a Redemptorist brother. Only for that snow, he says, he would have been a White Father Brother! Brother James hails from Co. Longford, near NewtownCashel -from Clonfower, Lanesboro, Co. Longford, to be precise. He comes from a family of 7, three boys and four sister, some now deceased.. He met the Redemptorists through a mission. Later, while snow-bound, he spotted in the Redemptorist Record magazine that the Redemptorists had Brothers: he changed the address and wrote to them Instead of the White Fathers. He posted the letter to Fr. Hugo Kerr in Dundalk. He got a reply within a week. Two months later, he was in the Redemptorists. On the Feast of Our Lady of Lourdes, February 11th 1949, Brother James (known then as Brother de Sales, after the gentle Saint Francis de Sales) took his first vows. Beginning in Cluain Mhuire, Galway, he moved, in the course of the years, from there to Limerick, to Esker, Cluain Mhuire, Esker, Limerick, Belfast (Clonard), Limerick, Dundalk, Limerick – also for six months in a Redemptorist Mission Community in the States – and finally, in 1984 to Esker. He has been here in our community of Esker, Athenry, for almost 35 years! He is still hale and hearty, thank God! He celebrates 70 years as a Professed Redemptorist, on this February 11th, 2019. 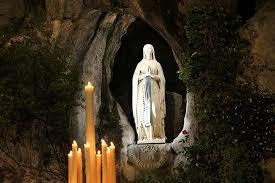 Feast of Our Lady of Lourdes. We ask her prayers for him, and we pray God’s blessing on him in every way. Rath Dé ort, a Shéamuis! Míle buíochais! Congratulations! P.S. 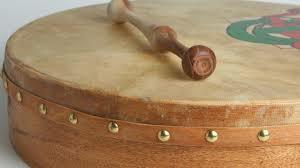 Brother James is a cool hand at the bodhran! He still goes to his seisiúns twice a week. 54b: Religious profession, therefore, becomes the definitive act of the whole missionary life of Redemptorists. Still blooming! Photo: Seamus Devitt C.Ss.R. ← Happy 97th Birthday Fr. Anthony Mulvey, Esker Redemptorist Community.